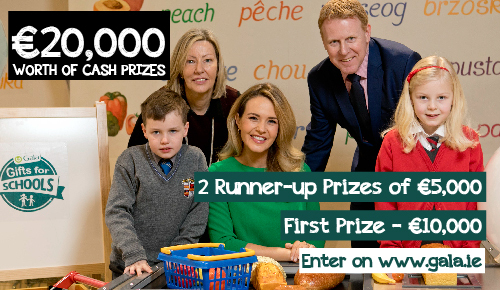 Primary schools from across Ireland were invited to enter the competition by submitting a 30 second video, via the Gala website, telling Gala how their school would benefit from the prize money. One winning primary school was awarded a €10,000 cash gift, and two runners-up schools benefitted from cash gifts of €5,000 each. As part if Gala’s 20th anniversary celebrations, on Friday 4th May – Gala visited Caherline National School in Caherconlish, Limerick, to donate a huge €10,000 to the school as part of its Gala Gifts for Schools competition! Caherline National School was named as the winner in the Gala Gifts for Schools competition, following the school summitting a 30 seconds video on how they would spend a ‘Gala Gift’ at the school to improve the education and school days of their pupils. A judging panel, comprising of actress, Aoibhín Garrihy; Editor of Primary Times, Marie O’Reilly; and Gala Retail’s CEO, Gary Desmond, deemed Caherline National School to have one of the top videos on the day. Actress Aoibhín Garrihy surprised the school by appearing at a special assembly in which she gifted the school, on behalf of Gala Retail, a huge €10,000 which the school pledged to spend on an ASD classroom to cater for the needs of children with Autism who attend the school. Teacher at Caherline National School, Orlagh Eichholz, explains: When I first heard about the Gala Gifts for Schools competition, I was determined that our pupils and I would be as creative as possible and create a video that visually showed our school and how a ‘Gala Gift’ could make a huge difference to our facilities for pupils with autism at Caherline National School. Aoibhín Garrihy was joined by Gala’s CEO, Gary Desmond and local Gala retailers at the prize presentation at Caherline National School. Mr Desmond adds: “The creativity and innovation shown in the videos that we received from Primary Schools across Ireland was outstanding. It was extremely hard to judge the competition based on the calibre of entries, however the video from Caherline National School really stood out thanks to its creativity, innovation, how a Gala cash gift could really benefit the school, and of course, its pupils being the stars of the show in the video! 9 Allen National School, Co. Kildare. https://vimeo.com/265772244 Kilmeague, Co. Kildare. 40 Aston Village Educate Together National School https://youtu.be/rASPQBw4ct8 Peter Fleming, Main Street, Slane, Co. Meath. 69 Kealkill National School, (Co Cork) https://youtu.be/gMQgNufZZI4 Burke’s Gala. Kealkill, Co Cork.